Armored Saint is a heavy metal band originating from Los Angeles, California. Armored Saint was formed in 1982 by brothers Phil Sandoval (guitar) and Gonzo Sandoval (drums), and guitarist David Prichard, while attending South Pasadena High School. Next to join were singer John Bush also a South Pasadena High School Alumni and bassist Joey Vera. Gonzo Sandoval came up with the name after getting stoned with the other band members and seeing the film Excalibur at a theater in Monterey Park. 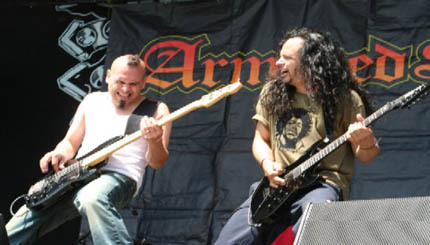 Armored Saint recorded a five song demo that landed the song "Lesson Well Learned" on the compilation album Metal Massacre II. Three of these demo songs were then used for the band's self-titled EP on Metal Blade Records in 1983. The group then signed with Chrysalis Records in 1984.